For other uses, see Amsterdam Island. Île Amsterdam (French pronunciation: ​[ilamstɛʁdam]), also known as Amsterdam Island, New Amsterdam, or Nouvelle Amsterdam, is an island of the French Southern and Antarctic Lands in the southern Indian Ocean that together with neighbouring Île Saint-Paul 85 km (53 mi) to the south forms one of the five districts of the territory. The research station at Martin-de-Viviès, first called Camp Heurtin and then La Roche Godon, is the only settlement on the island and is the seasonal home to about thirty researchers and staff studying biology, meteorology, and geomagnetics. Orthographic projection centred over Île Amsterdam. 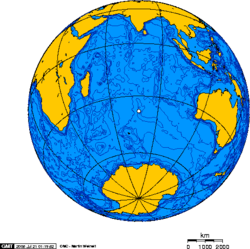 The island is roughly equidistant to the land masses of Madagascar, Australia, and Antarctica – as well as the British Indian Ocean Territory and the Cocos (Keeling) Islands (about 3,200 kilometres, 2,000 mi from each). The island is named after the ship Nieuw Amsterdam, which is in turn named after the Dutch settlement of New Amsterdam (named after the Dutch capital Amsterdam) that later became New York City in the United States. The island was discovered by the Spanish explorer Juan Sebastián de Elcano on 18 March 1522 during his circumnavigation of the Earth. However, he did not name the island. Having found the island unnamed, Dutch captain Anthonie van Diemen named it Nieuw Amsterdam after his ship on 17 June 1633. The first recorded landing was made in December 1696 by Dutchman Willem de Vlamingh. French Captain Pierre François Péron claims he was marooned from 1792 to 1795 on the island. Peron's Memoires, in which he describes his experiences, were published in a limited edition, now an expensive collectors' item. There was confusion in the early days between Amsterdam and Saint Paul Islands. The first sealers landed in 1789. Between that date and 1876, 47 sealing vessels are recorded at the island, 9 of which were wrecked. Relics of the sealing era can still be found. On 11 October 1833 the British barque Lady Munro was wrecked at the island. Of the 97 persons aboard, 21 survivors were picked up two weeks later by a United States sealing schooner, General Jackson. The islands of Île Amsterdam and Île Saint-Paul were first claimed by Martin Dupeyrat for France in 1843. However, the governor of Réunion refused to ratify the act of possession and France took formal control only in October 1892. In January 1871 an attempt to settle the island was made by a party led by Heurtin, a French resident of Réunion. After seven months, their attempts to raise cattle and grow crops were fruitless, and they returned to Réunion, abandoning the cattle on the island. In May 1880 HMS Raleigh circumnavigated the island searching for a missing ship the Knowsley Hall. A cutter and gig were despatched to the island to search for signs of habitation. There was a flagpole on Hoskin Point and 50–70 yards (46–64 m) north were two huts, one of which had an intact roof and contained three bunks, empty casks, an iron pot and the eggshells and feathers of sea-birds. There was also an upturned serviceable boat in the other hut, believed to belong to the fishermen who visited the island. The first French base on Île Amsterdam was established in 1949, and was originally called Camp Heurtin. The Global Atmosphere Watch still maintains a presence on Île Amsterdam. From 1987–98, there were frequent amateur radio operations from Amsterdam Island. There was a resident radio amateur operator in the 1950s, using callsign FB8ZZ. In January 2014 Clublog listed Amsterdam and St Paul Islands as the seventh most-wanted DXCC entity. On 25 January 2014 a DX-pedition landed on Amsterdam Island using MV Braveheart and began amateur radio operations from two separate locations using callsign FT5ZM. The DX-pedition remained active until 12 February and achieved over 170,000 two-way contacts with amateur radio stations worldwide. A large Kelvin wake cloud formation, caused by lee waves from Île Amsterdam (lower left). The volcanic island is a potentially active volcano which last erupted in 1792. It has an area of 55 km2 (21 sq mi), measuring about 10 km (6.2 mi) on its longest side, and reaches as high as 867 m (2,844 ft) at the Mont de la Dives. The high central area of the island, at an elevation of over 500 metres (1,600 ft), containing its peaks and caldera, is known as the Plateau des Tourbières (Plateau of Bogs). The cliffs that characterise the western coastline of the island, rising to over 700 metres (2,300 ft), are known as the Falaises d'Entrecasteaux after the 18th-century French navigator Bruni d'Entrecasteaux. Île Amsterdam has a mild, oceanic climate under the Köppen climate classification, with a mean annual temperature of 14 °C (57.2 °F), rainfall of 1,100 mm (43.3 in), persistent westerly winds and high levels of humidity. Under the Trewartha climate classification the island is well inside the maritime subtropical zone due to its very low diurnal temperature variation keeping means high. Phylica arborea trees occur on Amsterdam, which is the only place where they form a low forest, although the trees are also found on Tristan da Cunha and Gough Island. It was called the Grand Bois ("Great Forest"), which covered the lowlands of the island until forest fires set by sealers cleared much of it in 1825. Only eight fragments remain. The island is home to the endemic Amsterdam albatross, which breeds only on the Plateau des Tourbières. Other rare species are the brown skua, Antarctic tern and western rockhopper penguin. The Amsterdam duck is now extinct, as are the local breeding populations of several petrels. There was once possibly a species of rail inhabiting the island, as a specimen was taken in the 1790s (which has been lost), but this was either extinct by 1800 or was a straggler of an extant species. The common waxbill has been introduced. Both the Plateau des Tourbières and Falaises d'Entrcasteaux have been identified as Important Bird Areas by BirdLife International, the latter for its large breeding colony of Indian yellow-nosed albatrosses. There are no native land mammals. Subantarctic fur seals and southern elephant seals breed on the island. Introduced mammals include the house mouse and brown rat. Feral cats are present. A distinct breed of wild cattle, Amsterdam Island cattle, also inhabited the island from 1871 to 2010. They originated from the introduction of five animals by Heurtin during his brief attempt at settlement of the island in 1871, and by 1988 had increased to an estimated 2,000. Following recognition that the cattle were damaging the island ecosystems, a fence was built restricting them to the northern part of the island. In 2007 it was decided to eradicate the population of cattle entirely, resulting in the slaughter of the cattle between 2008 and 2010. ^ Péron (captain) (1824). Mémoires du capitaine Péron sur ses voyages aux côtes d'Afrique, en Arabie, à l'île d'Amsterdam, aux îles d'Anjouan et de Mayotte, aux côtes nord-ouest de l'Amérique, aux îles Sandwich, à la Chine, etc. Brissot-Thivars. ^ Headland, R.K. (ed.) (2018) Historical Antarctic Sealing Industry, Cambridge, Scott Polar Research Institute, p.166. ^ Imperial Twilight: The Opium War and the End of China's Last Golden Age. Alfred A. Knopf. 2018. ISBN 978-0307961730. ^ Chronological List of Antarctic Expeditions and Related Historical Events. Cambridge University Press. 1989. ISBN 978-0-521-30903-5. ^ Carroll, Paul (2003-06-29). "Amsterdam/St Paul: Discovery and early history". The South Atlantic and Subantarctic Islands. Archived from the original on 2012-10-23. Retrieved 2011-04-25. ^ a b "Editorial". The Cornishman (109). 12 August 1880. p. 4. ^ R. M. Holoch (2012-09-16). "FT5/Z – Amsterdam / St. Paul Islands and a Special Appeal". Archived from the original on 2014-03-03. ^ "Nouvelle Amsterdam (984)" (PDF). Fiche Climatologique: Statistiques 1981–2010 et records (in French). Meteo France. Archived from the original (PDF) on February 26, 2018. Retrieved February 26, 2018. ^ "Climate Normals for Martin de Vivies 1961–1990". National Oceanic and Atmospheric Administration. Retrieved February 28, 2013. ^ "Station Martin de Vivies" (in French). Meteo Climat. Retrieved November 5, 2017. ^ Sophie Lautier: "Sur l'île Amsterdam, chlorophylle et miaulements". Wikimedia Commons has media related to Île Amsterdam. "South Atlantic & Subantarctic Islands site, Amsterdam Island page". Archived from the original on 2010-01-17.